The statuette would be without the baroque interior design of the Green Vault 1723-1724 did not occur, because it owes its existence to the desire of Augustus the Strong, establish a value of his art collection in the new treasury Museum. This involved a 1581 as a gift from the Emperor Rudolf II. To the Elector Augustus arrived, with sixteen sometimes very large emerald crystals studded chunks of limonitic rock. The dark green gems are from the few years earlier developed emerald mine in Chivor-Somondoco (Colombia). At the behest of Elector August should this “natural wonders” in “Chur-Princely bull and tribal, to eternal Gedächtnüß” be preserved. Balthasar Permoser created for since 1723 in the development conceived Treasury Museum really original presentation of all possible means, the sculpture of a “Moor”. 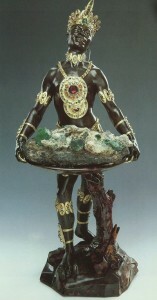 The young, powerful man in dark brown lacquered pearwood, the associated border on a tray tortoiseshell presents casual and supple Colombian Emerald level, is not a person in Africa, but an Indian. Although facial features and skin color are those of a black African, but the body tattoos ethnological exactly shown have him as well as a Native Florida from, as well as the precious necklaces and bracelets, breast ornaments, the feather crown, the loincloth and footwear, in accordance with an engraving Dinglinger workshop were created. Whether the two richly tattooed American Prince, who came as prisoners of war of the English captain Pecht after 1722 Dresden, have had a role model for the Mohr statuettes, devoid of probative value. However, they must have been admired as a true exotics, as the chronicler Johann Christian Krell reported that both after only three years of teaching spoke good Saxon and were eventually baptized.